Our Combination Beams are available in various styles to provide you with maximum versatility. 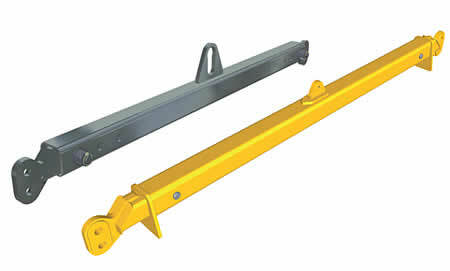 Combination Beams can be used as either a lifting or spreading beam. Our design team benefits from 100 years of experience, and all aspects are considered to ensure ease of use, durability and reliability. Other sizes and capacities are available on request. Dimensions are subject to commercial tolerances and change without notice. Always ensure that the correct sling angles and sizes are used. Always check the security of the load before lifting. Ensure that inner members do not drop when extending. Never extend or retract the beam when suspended. Never drill additional adjustment holes or use non-original adjustment holes. Never use the beam without the locking pin in place and ensure that it is fully inserted. Use only the original locking pin supplied. Large beam sections can be heavy, follow proper manual handling procedures when extending or retracting. Our beams are available with a variety of finishes, from galvanised, painted or powder coated. Our finishes are applied while the beam is fully dismantled, ensuring the best possible result. Adjustment Our Combination Beams are designed for maximum adjustment and flexibility so your beam can be adjusted to suit your needs on site.